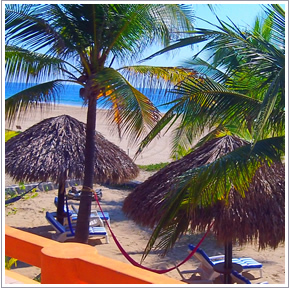 Tree Tops Bungalows - Located at Playa Blanca 10 minutes from Zihuatanejo - 5 minutes from the Airport. Easy access by taxi or combi. Artistically rustic, our cabanas are built entirely of wood and local natural materials, traditional thatched palapa roofs, adorned with bamboo, wooden levalor doors and windows. Fully furnished, with kingsize beds, dresser and drawers, table and chairs, and front porch with hammocks and lounge chairs. 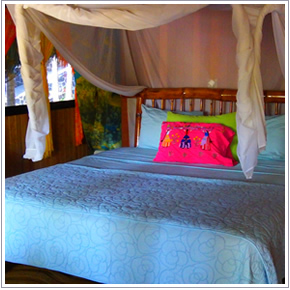 Colorfully decorated, charming, quaint and comfortable. Come and enjoy the magic of Tree Tops. More than just a hotel, Tree Tops is a place to escape from the pressures of your life. Leave your cell phone, pager, laptop, and worries at home and relax in peace and quiet. Focus on who you are, fall in love again, or think of nothing at all: anything is possible. Sleep to the sounds of the ocean. 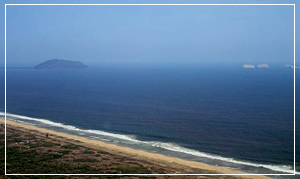 The beach is private and undeveloped, so there are no other hotels to disturb your privacy..
Playa Blanca is one of the most extensive of the coasts near Zihuatanejo, in the State of Guerrero. The natural environment in Playa Blanca is of great ecotourism interest because they inhabit large colonies of birds at risk of extinction, as is the case of white pelicans, flamingos and blue herons.